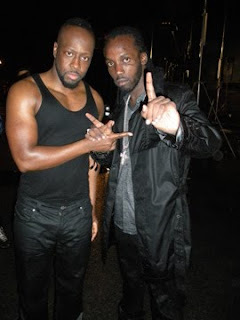 Gully Gad Mavado was in New York over the weekend shooting the video for "Hold On (Crossroads)" - the first single from multi-platinum artist Wyclef Jean's new album, that features the Dancehall megastar. Shot on location in Brooklyn's Navy Yard the video was shot through the night, climaxing with a scene overlooking the East River towards Manhattan as the sun came up. The song is a lament for all the fallen soldiers and is widely tipped to become an instant classic. With the song and video about to impact mainstream airwaves in the coming weeks, it looks like Mavado's rise to international super stardom is set to continue at a rapid pace. "They say real recognises real," said Mavado. "Clef is one of the realest people in a business that is very corrupt and its always a pleasure to collaborate with him. He's a great friend and incredibly talented and I think this song is something special. We're all expecting it to do big things." Wyclef's album is set for release in February 2010. Exclusive footage form the video shoot can be scene on out You Tube channel www.youtube.com/AllianceGiants or by clicking the link below.